Extremists Jewish settlers physically attacked a Jerusalemite kid named Abdul-Salam Qaimari, 17, as he was riding his bicycle on Wadi Rababa street in Silwan district, south of the Aqsa Mosque. 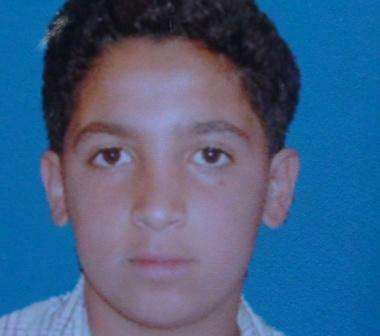 Wadi Hilwa information center said the boy was admitted to Hadassah hospital in Issawiya district. The boy, for his part, explained that he was on his way back home along with his eight-year old brother following a visit to their uncle's house in Beer Ayoub neighborhood when four settlers attacked him, pepper sprayed him and pushed him off a 10-meter mountain before fleeing the scene. He added that three young men passing down the mountain spotted him and called an ambulance. Many similar attacks on Palestinian young men have been reported lately in the West Bank and Jerusalem, but the Israeli police have not acted to bring the assailants to justice. 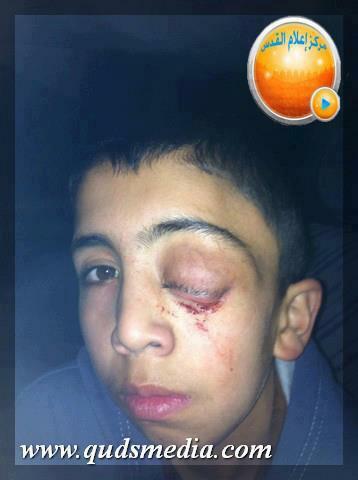 On 19 November 2012, a 16 year-old boy from Beit Furik, Nablus, was arrested by Israeli soldiers at 11:00 am, and accused of throwing stones. Sameh’s hands were then tied tightly behind his back with a single plastic cord. “I felt so much pain that I started screaming,” he says. He was blindfolded and taken to a military vehicle, where he was forced to sit on the metal floor. “Inside the jeep, the soldiers started beating me and slapping me. One of them called me a ‘despicable dog’,” reports Sameh. Sameh was then taken to Huwwara interrogation and detention centre and was forced to sit on the ground for about two hours. 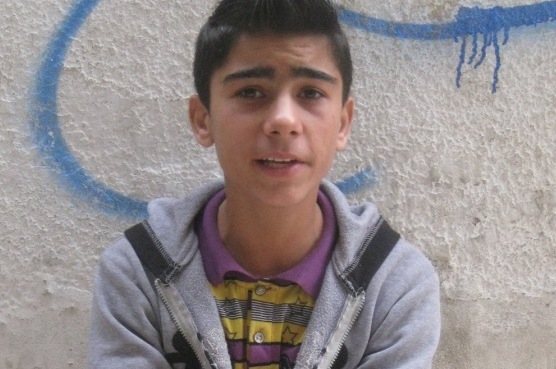 After a brief medical check, he was transferred with two other children to Ari’el police station for interrogation. There, he had to wait for six hours while sitting on the ground. Since “there was no interrogator available”, the boys were taken back to Huwwara. The interrogator wrote Sameh’s statement and ordered him to sign. “I don’t know if the statement was written in Hebrew or Arabic, because he did not let me read it. He would only let me see the space where I should sign,” says Sameh. Following his interrogation, Sameh was transferred to Megiddo prison, inside Israel, in violation of Article 76 of the Fourth Geneva Convention, which prohibits such transfers. Sameh reports being strip searched on arrival. On 1 December 2012, a 14-year-old boy, his father and other relatives are fired upon by an Israeli gunboat and later detained whilst fishing within Israel’s six nautical mile limit. Abdullah lives with his family in Gaza city. He works with his father and his older brother as a fisherman. “My father has a small boat and we live off the fish we catch. We live in very difficult economic conditions. My father and my brother earn around 1,500 shekels per month [around US $ 390], and that is not enough to support our big family,” Abdullah explains. On Saturday, 1 December 2012, Abdullah, his father and brother left the house at around 5:00 a.m. to go fishing. At the port, they ran into Abdullah’s brother-in-law and invited him to come along with them to fish. “We headed to an area called al-Waha, about four-and-a-half nautical miles from the shore,” says Abdullah. “After the recent truce with Israel, we are now allowed to fish within six nautical miles. However, my father doesn’t like to risk going to the limit because the Israeli gunboats arrest and shoot at the fishermen, and sabotage their nets and boats,” he adds. After the interrogation, the fishermen were made to wait in the room for many hours. Abdullah fell asleep from exhaustion. “At around 11:00 p.m., a soldier came and ordered us to get into a bus. They untied us and removed the blindfolds, and replaced the ties with handcuffs around my hands and ankles. The rings around my ankles were connected with a chain. They took us to Erez Crossing Point and a soldier ordered us to walk in a line, not in zigzag, or they would shoot us.” At Erez, they were asked questions about their detention and interrogation by the Palestinian authorities. 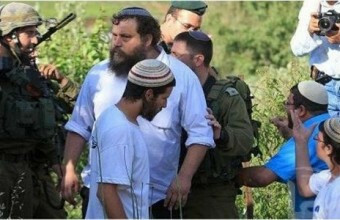 International Solidarity Movement (ISM) said in a press release that three male settlers speculated to be between seventeen and nineteen years old attacked two Palestinian children in Hebron governorate. The 9-year-old Younes Azzeh was kicked in the shins, thighs and generally roughed up and his 14-year-old sister Rahad Azzeh was accosted by a hurled stone hitting her lower back. The settlers attacked the two Palestinians while they were walking home after school at around one o'clock in the afternoon. It's worth mentioning that their house is near to Ramat Yeshay settlement which has historically caused numerous problems for Hashem Azzeh's family, who is the father of the children. The ISM also said the Azzeh family is of the few Palestinians allowed to walk on the road close to where the incident took place besides Zionists. The incident took place around checkpoint 57 in Tel Rumeida, this means that Israeli soldiers were nearby while the aggression took place. On 1 December 2012, a 17-year-old fisherman and his crewmates are stopped by an Israeli gunboat, five nautical miles off the coast of Gaza. 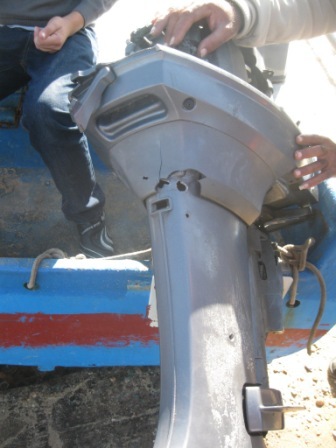 The fishermen are detained and their boat is confiscated. On 1 December 2012, at around 5:00 a.m., Mohammad, his cousin and three other crew members headed out to sea to fish about five nautical miles off the coast of Gaza. “When we arrived five nautical miles off the coast, I could see Israeli gunboats about a mile ahead, at six nautical miles off the coast.” As the fishermen were within the new six mile fishing limit, neither Mohammad nor his crew mates were concerned. “At around 9:00 a.m. we threw the net into the sea and we were surrounded by many other fishing boats. Suddenly, I saw an Israeli gunboat chasing fishing boats about half-a-mile ahead of us. As the gunboat approached us we started to head back to shore. The gunboat approached to within 20 metres and ordered us to stop our engine,” recalls Mohammad. “There were many soldiers on the gunboat pointing their weapons at us. Then, four inflatable boats approached and surrounded us. There were around 12 soldiers in each boat dressed in black uniforms with their faces covered. One inflatable approached and we were ordered to stop the engine in Arabic or they would shoot at it. Then suddenly, a soldier shot one bullet directly at the engine,” recalls Mohammad. “The engine stopped and we were ordered to take our clothes off and get into the inflatable. We all stripped down to our underwear; it was really cold that day. We got wet travelling in the inflatable which made us even colder,” says Mohammad. Meanwhile, another inflatable towed their fishing boat away. Mohammad and the fishermen were transferred to the gunboat, which was now about six nautical miles off the coast of Gaza. Once on board, their hands were tied behind their backs with plastic ties and they were blindfolded. At around 11:00 a.m., the fishermen arrived at the Israeli port of Ashdod. On arrival at the port, soldiers ordered the fishermen to take off their underwear. “For about 15 minutes soldiers stood their laughing at us,” recalls Mohammad. “I felt so humiliated.” After 15 minutes the fishermen were given some clothes and put inside a trailer which had mattresses on the floor. They were then given a meal which Mohammad describes as “disgusting”. After eating the fishermen were each given a quick medical check. Following the check, the fishermen were individually interrogated. “The interrogator was a bald man in civilian clothes,” says Mohammad. “He spoke fluent Arabic.” The interrogator asked Mohammad general questions about what he did, and about his family. Following the interrogation, Mohammad was taken back to the trailer and his hands were tied. At around 10:00 p.m. the fishermen were put in a bus and driven to Erez Crossing, on the border with Gaza. “A soldier took off our handcuffs and told us to walk in line or they would shoot us.” On arrival back in Gaza the fishermen were questioned by Palestinian internal security before arriving home at 12:00 a.m. “The fishing boat was confiscated and we are all now unemployed. I won’t go fishing again anyway, because of the humiliation and the terror they put us through,” says Mohammad. 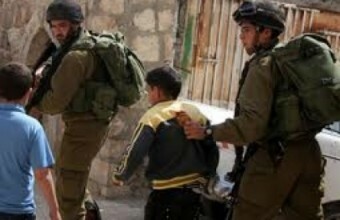 The international organization for the defense of children has said that the Israeli occupation soldiers savagely beat up a Palestinian child after breaking both his legs. The organization quoted the 16-year-old boy Mahmoud Qatna as saying that he was heading to an area near the separation wall in his village Beit Sorik along with a number of his friends when the soldiers surprised them. He said that the soldiers arrested him along with two of his friends, threw him on his stomach on the ground and started beating him savagely, adding that before that he was hit with a rubber bullet in his left leg fired by those soldiers. Qatna said that he was screaming out of pain and told the soldiers that his leg had broken but they did not heed his screams and continued to beat him. He said that the soldiers took him to an asphalted road where he was beaten anew then he was carried to a roadblock where he was held blindfolded and handcuffed under the rain for half an hour. The boy said that he was taken to an army base where an interrogator questioned him about going to the wall, adding that the questioning took place at midnight. He said that the interrogator accused him of throwing stones at the soldiers, which he absolutely denied. 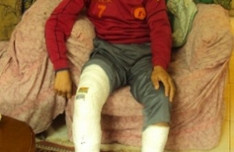 Qatna said he was then taken to Ofer jail then to hospital the next morning where the doctors discovered that both his legs were broken and where he was served food and allowed to the bathroom for the first time since his arrest. Qatna was returned to Ofer jail where he was beaten on the way back then held for 16 days during which he was taken to court five times. In the fifth hearing he was released on bail pending trial. On 24 September 2012, a 17-year-old boy from Beita village, in the occupied West Bank, is arrested by Israeli soldiers at a checkpoint at the entrance to his village and held in solitary confinement in Israel’s Al Jalame prison for 29 days. The jeep travelled for about 15 minutes before arriving at Huwwara interrogation centre. “They pulled me out of the jeep and made me sit on the ground for about three hours. It was really cold. I asked them to get me some water to drink, and one of them brought a bottle of water and put it close to my mouth and ordered me to drink, but it was empty. He laughed and the others laughed and made fun of me. He did this three times. They did not give me any water,” recalls Mujahed. About three hours later a man approached and kicked me hard on my legs with his combat boots and removed the blindfold.” Mujahed asked why he had been arrested, but he was told to shut up. He was then taken into a room and strip searched. “I was completely naked and was very ashamed standing in front of two soldiers. It was a big humiliation,” recalls Mujahed. Later that day Mujahed was transferred to Al Jalame interrogation centre in Israel. The transfer and detention of Mujahed in Israel violates articles 49 and 76 of the Fourth Geneva Convention, to which Israel is a signatory. On arrival at Al Jalame, Mujahed was handed over to an interrogator who introduced himself as “Nazir”. The interrogator told Mujahed that he had the right to consult with a lawyer, but he was denied access to a lawyer for 15 days. “He accused me of carrying out security offences in general, without specifying any details. Later he accused me of throwing stones and Molotov cocktails,” recalls Mujahed, who was interrogated numerous times for up to six hours whilst tied by the hands and feet to a chair. In total, Mujahed spent 52 days in Al Jalame, 29 days of which were in solitary confinement. During this time he was held in a number of different cells. “All the cells looked the same but some were bigger than others. They all lacked windows. The lights were turned on the whole time. Also the toilets had a horrible smell,” recalls Mujahed. On or about 15 November, Mujahed was transferred to Megiddo prison, also inside Israel, where he is currently detained. In October 2011, the UN Special Rapporteur on Torture submitted a report to the UN General Assembly [PDF] calling for a total prohibition on the use of solitary confinement for children as it can frequently amount to torture. Names: Naim and Ali B. 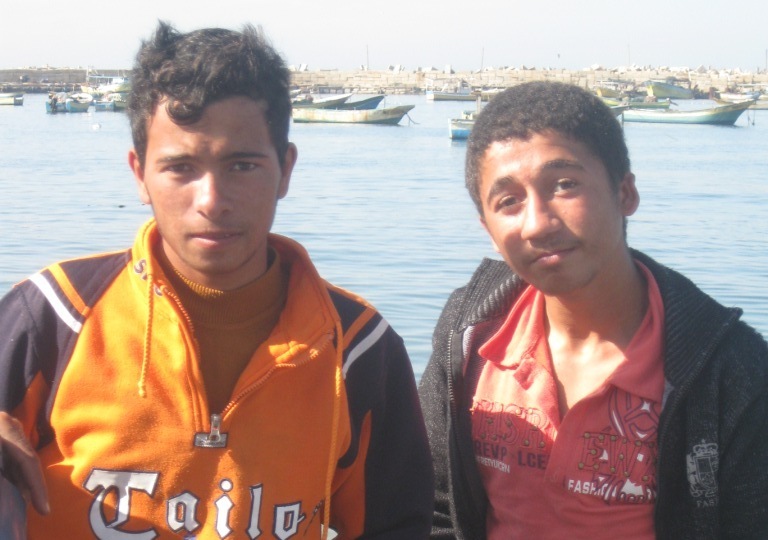 On 29 November 2012, two boys are fired upon by Israeli patrol boats and detained for two hours whilst fishing within Israel’s new six nautical mile fishing limit. This case appears to constitute a violation by Israel of the ceasefire agreement concluded on 22 November. Naim and Ali are cousins and live in ash-Shate'a refugee camp in Gaza. The boys come from a family of fishermen. “I go fishing every morning with my uncles and relatives and earn around 15 to 20 shekels a day [around US$ 5], depending on how much fish we catch,” says Ali. “Before the recent Israeli offensive on Gaza, the area designated for fishing was three nautical miles. After the ceasefire agreement on 21 November, it was extended to six nautical miles. However, there hasn’t been a big difference in the quantity and quality of the fish we catch. There are plenty of fish about 11 nautical miles off the Gaza shore, but not within 10 nautical miles,” says Ali. Eventually, their engine was shot, and the soldiers “threw a stun grenade on our boat which made a horrible sound and created thick smoke.” The fishermen were ordered to gather in one place and take their clothes off. The soldiers boarded their boat, tied their hands behind their backs, and transferred them to the rubber boats, where they were blindfolded. Naim, Ali and the other fishermen were then taken to a bigger patrol boat. Once on board, “an Israeli soldier approached me and asked me for my name and age in Arabic. ‘Why did you come here?’ he asked. ‘To fish and make a living,’ I replied. My hands were still tied behind my back. They were hurting so much, that I told the soldier I could not stand the pain anymore. Another soldier came and cut the tie off. Maybe he realised I was young and that's why he did it,” says Ali. With his hands free, Ali lowered his blindfold to see where he was. 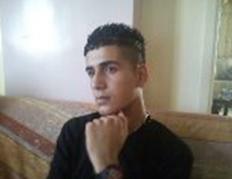 On 14 October 2012, a 16-year-old boy from Nablus, in the occupied West Bank, is arrested by Israeli soldiers and transferred to Al Jalame interrogation centre, inside Israel, where he is held for 12 days in solitary confinement. Sixteen-year-old Adham and his friend Yaser went to the Israeli military co-ordination office near Nablus to apply for a permit to work inside Israel. They submitted their I.D. cards and about an hour later they were asked to enter the building where they were searched and detained. “Shortly after that they tied my hands from the front with two plastic ties and blindfolded me. They never told us why they were arresting us,” says Adham. The two boys were then taken on foot to Huwwara interrogation centre. After being searched again the boys were detained in separate cells. “One of the soldiers kept insulting me and calling me a donkey. He also insulted my mother,” says Adham. On or about 25 October, Adham was transferred to Megiddo prison, also inside Israel, where he is currently detained. In total, he spent 12 days in solitary confinement at Al Jalame. On 22 October 2012, a 16-year-old boy from Nablus, in the occupied West Bank, is arrested by Israeli soldiers at 2:00 a.m. and held in solitary confinement in Israel’s Al Jalame prison for four days. “At around 2:00 a.m., I was sleeping when my father came and woke me up and told me that Israeli soldiers were in our yard,” recalls 16-year-old Jamal. Jamal’s father took the family’s I.D. cards outside to the soldiers. One of the soldiers asked him to bring Jamal outside. Once outside, Jamal was told that he had to accompany the soldiers and his family were ordered back inside the house. “All my siblings were awake and the little ones were terrified,” recalls Jamal, whose hands were tied and he was blindfolded. On arrival at Al Jalame Jamal was asked some questions about his health by a doctor, but was not examined. He was then taken to an interrogation room. Jamal was not given access to a lawyer or his parents. After about 30 minutes he was taken to Cell 19 where he was held in solitary confinement. The cell had no windows and the light was left on 24 hours per day. Jamal was interrogated a number of times and the interrogator threatened to keep Jhim in solitary confinement for a long time if he did not confess. “I actually believed him when he said this. My body started shaking and I felt really dizzy,” recalls Jamal. “I begged him not to put me back in the cell and I confessed to throwing stones, Molotov cocktails and grenades at military jeeps, even though I never did it,” says Jamal. In total, Jamal spent four days in solitary confinement at Al Jalame before being transferred to Megiddo prison, inside Israel, where he was strip searched on arrival. On 25 October 2012, a 17-year-old boy from Nablus, in the occupied West Bank, is arrested by Israeli soldiers at 4:00 a.m. and held at Al Jalame interrogation centre in solitary confinement for 18 days. “At around 4:00 a.m., I was sleeping when my father woke me up and told me Israeli soldiers were in our yard and they wanted to see me,” recalls 17-year-old Suleiman. The family quickly dressed and went out into the yard. The commanding officer told Suleiman that he wanted to talk to him alone and sent the rest of the family back inside. Suleiman was asked if he possessed a gun and he replied that he did not. Suleiman was then arrested but was not told why. His hands and feet were restrained and he was then led to a waiting military vehicle. 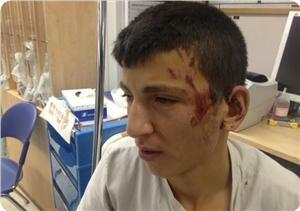 Approximately 10 minutes later Suleiman arrived at Huwwara interrogation centre, outside Nablus. After being asked some medical questions by a doctor he was strip searched and then detained in a room until 11:00 a.m. Suleiman was then transferred to Al Jalame interrogation centre, near Haifa, inside Israel. Suleiman’s transfer and subsequent detention in Israel is unlawful by virtue of Articles 49 and 76 of the Fourth Geneva Convention. On arrival at the interrogation centre Suleiman was strip searched for a second time. He was then taken for interrogation and asked some general questions by a police interrogator named “Nazir Sader” before being taken to an intelligence officer who introduced himself as “Barack”. “‘Barack made me sit in a low metal chair tied to the floor in the middle of the room and tied my hands and feet to the chair. He kept me like that for hours. It was really painful and uncomfortable to sit in this position,” says Suleiman, who was questioned without being informed of his right to silence, without access to a lawyer and without a parent being present – rights Israeli children, including those living in the settlements, are entitled to. The interrogator accused Suleiman of weapon possession and attacking military vehicles and settler cars in the occupied West Bank – allegations he denied. “He interrogated me at least 16 times in the same manner; three to four hours each time. But I never confessed,” says Suleiman. Later on, other boys were brought into the interrogation room and told Suleiman that they had provided confessions against him. 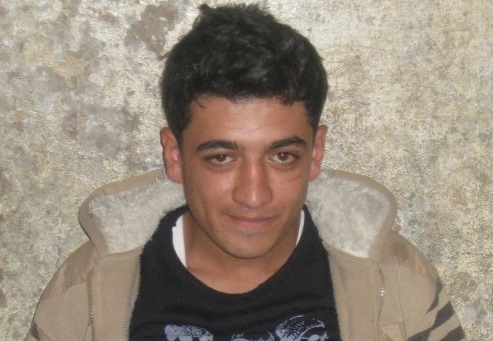 Suleiman was held for 22 days at Al Jalame, 18 of which were spent in solitary confinement. Most of that time was spent in Cell No. 36. “It is very small and has no windows,” says Suleiman. “The lights were on non-stop.” After 22 days, Suleiman was transferred to Megiddo prison, also inside Israel, and was strip searched on arrival.